Spending days and nights walking, climbing, and generally adventuring outdoors is your thing. You love a good hike, but that can be ruined without the proper outdoor footwear. Likewise, a bad or mediocre hike can be made enjoyable, comfortable, and safe with the pe ... (see full details) (see specifications) #62241. Spending days and nights walking, climbing, and generally adventuring outdoors is your thing. You love a good hike, but that can be ruined without the proper outdoor footwear. Likewise, a bad or mediocre hike can be made enjoyable, comfortable, and safe with the perfect pair of men's hiking boots. These Danner Men's Brown/Red 62241 Mountain 600 Hiking Boots from Working Person's Store can give you the best outdoor wearing experience possible. You can rely on the protection from wetness these brown and red boots provide when you're outside. 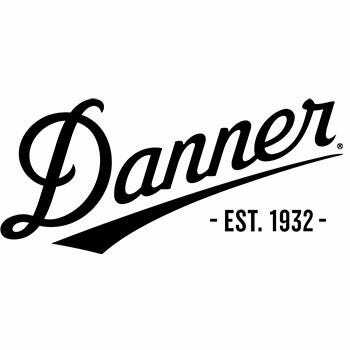 They're completely waterproof thanks to Danner Dry technology, which comes in the form of a barrier. The 100% waterproof barrier allows moisture on the inside, like sweat, to escape while making sure moisture on the outside, like water, cannot get inside. In addition to being able to keep your feet dry, these slip-resistant waterproof boots are comfortable. They provide underfoot support that comes from a Vibram SPE midsole. The midsole is crafted from rubberized EVA, which means that it maintains the same cushioning properties of EVA without being as weak. The rubberized EVA will last longer than standard EVA, so you'll get to benefit from comfort for many uses. The best aspect of the EVA midsole, however, is its shock absorbing and rebounding properties. As your feet strike the ground in these suede boots, the midsole absorbs the force of the resulting impact and redirects the energy to rebound into each step. Therefore, each movement on your part is more effective, and you won't have quite as sore feet from extended use. It's a win-win. And last but not least, these men's Danner boots are durable, and they'd have to be to keep you comfortable and protected from wetness for hikes to come. The shock-absorbing Mountain 600 boots feature an upper made from rich, thick, hardy suede. Beneath the tough suede upper is an equally strong Vibram Fuga outsole. It is perfect for outdoor use because it is made with self-adapting lugs and specially formulated Megagrip compound. The lugs and Megagrip compound provide extreme slip resistance on a number of surfaces, both wet and dry. The incredible grip resists slips and falls. Have a safer, more comfortable trip outdoors with these Danner Men's Brown/Red 62241 Mountain 600 Hiking Boots. Order them here at Working Person’s Store today. Danner Boots: Men's Brown/Red 62241 Mountain 600 Hiking Boots is being added to your cart.